Bite into the night with Shark Flashing Pins! These are great for all animal lovers, land and sea. Dimensions: Height: 1.3 in. , 3.30 cm. Width: 2.0 in. , 5.08 cm. 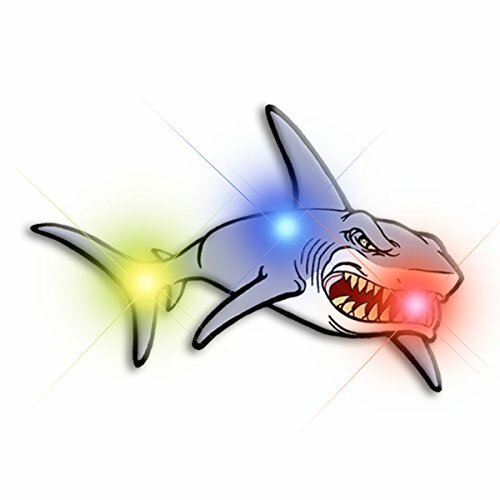 LED Colors: 1 Blue, 1 Red, 1 Yellow Batteries: Includes 2 replaceable CR927 Batteries. Great Party Favors for Shark Week, Marine Parks, Aquariums & More! If you have any questions about this product by FlashingBlinkyLights, contact us by completing and submitting the form below. If you are looking for a specif part number, please include it with your message.